Unfortunately, due to a case of self-confessed ‘baby-brain’, George got more than she bargained for when she signed up for her first triathlon (the Outlaw half) at 37 weeks pregnant. “I confessed to my husband. His response was “you fool!” but then he said “go for it, if anyone can, you can.” At this point I’m not sure I ever believed I would do it but decided to go for it! My family and friends were concerned about me – and many believed that the intense training would affect my ability to breastfeed, but as far as I am aware, it hasn’t, and Arlo has had what he’s needed. Women can often lose confidence in what their bodies can do after having babies, but my body has not fallen apart, in fact it’s the opposite! George was off out for her first run after labour just two weeks after giving birth. “I started training very soon after I had my baby. Apart from developing Bell’s Palsy postpartum I felt good, and so I started running when Arlo was just 2 weeks old. Albeit short distances at first, it gave me the head space I needed from my busy family life, and a break from feeding. Early morning boot camp started again when he was 6 weeks old and then swimming soon after that. My husband would get up early with the children so I could squeeze in an early run, and then again when I needed to rest. I can see how lucky I am to have such support. He even sometimes worked at home so I could make it to my coaching sessions. Eight weeks after having Arlo, I booked a charity place for the Brighton Marathon. And a couple of weeks after that I made the decision that to achieve my goal I would need to get a personal coach who didn’t laugh at me for taking on such a crazy challenge! 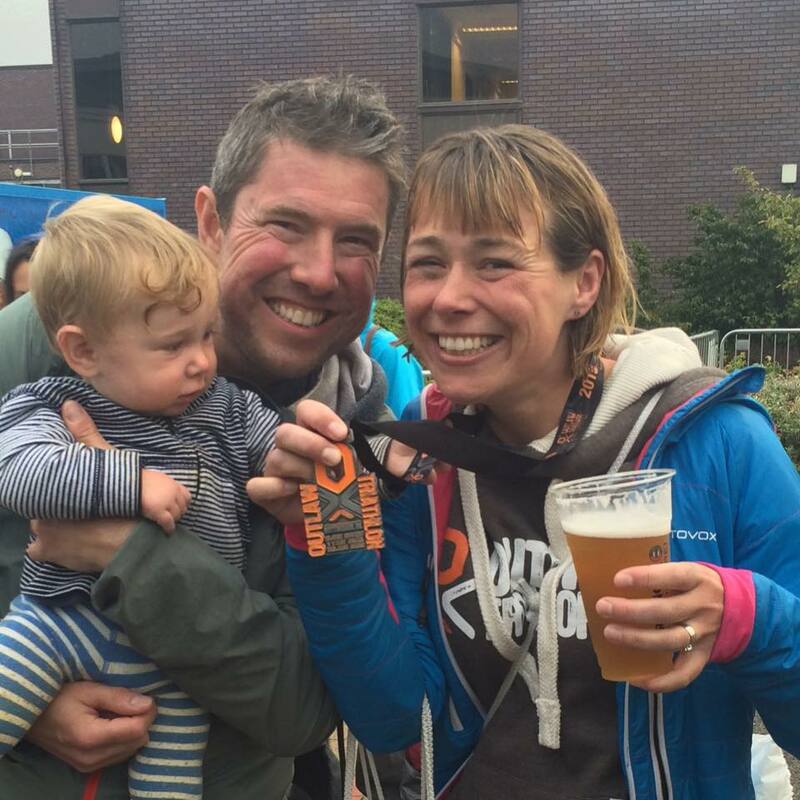 Between having her baby and arriving at the Outlaw start line, George finished a marathon, several sportives, an open water swim race, two sprint triathlons and an Olympic distance triathlon. Phew! Unfortunately when race day arrived George was suffering from carpal tunnel, another pregnancy symptom. “I’d get tingles in my fingers which lead to clawing of the hands and little use of them. The bike is where this causes me problems. The tri bars and aero bottle helped, but I had to stop to eat and refill my water due to my poor hand mobility. I struggled to undo my helmet and change my shoes in transition! It didn’t help my confidence, but I did learn to manage it. Thank you to George for sharing her story and inspiring me to be an Ironmum one day… If you’d like to donate to George’s chosen charity MAMA Foundation, you can do so by clicking here.